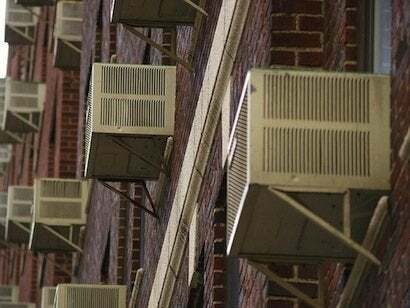 Before you pull your window air conditioner out of storage, consider its age. Efficiencies have improved so much that replacing an old clunker with a new unit could cut your cooling costs in half. Regardless of age, all units need maintenance every season and about once a month during the season. First, check your manual for instructions on discharging the capacitors to avoid a shock. Dirt is your air conditioner’s worst enemy. Clean out the drain ports, Vacuum the evaporator and condenser coils and gently straighten any bent fins with a fin comb, which you can get at most hardware stores. Remove the filter and clean or replace it. Run the unit for a few minutes to see how it does. If the fan’s making noise, try tightening the blade’s set screw and the bolts holding the fan unit to its housing. The parts that are sealed should be repaired by a professional, but check early so you won’t be put on someone’s waiting list in 90-degree heat!